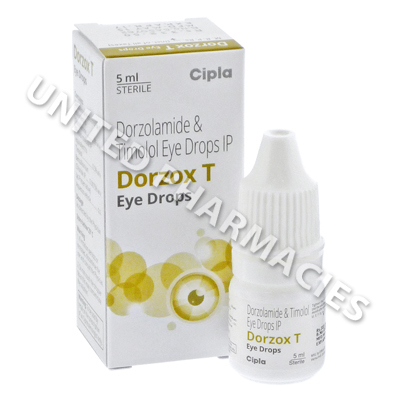 Dorzox-T Eye Drops (Dorzolamide/Timolol) are indicated for the treatment of ocular hypertension (high pressure in the eye) and glaucoma. Dorzox-T Eye Drops (Dorzolamide/Timolol) are indicated for the treatment of ocular hypertension (high pressure in the eye) and glaucoma. These eye drops contain two active ingredients, allowing patients to enjoy the combined benefits of two medicines in a single solution. Dorzolamide is a type of medicine referred to as a topical carbonic anhydrase inhibitor, and the other ingredient (timolol) is a beta adrenergic receptor blocking agent. These eye drops are used as an anti-glaucoma agent, and each of the active ingredients function by decreasing the secretion of aqueous humor. As excess production or a reduction in drainage of this fluid can lead to intraocular pressure, reducing its secretion leads to a lowering of pressure in the eye, thereby helping to lower the risk of damage to the eyes. If you are affected by eye conditions, and your doctor recommends using Dorzox-T Eye Drops (Dorzolamide/Timolol) to treat your condition, a dosage schedule will be prescribed for you by your doctor. Patients who are unsure of how to properly apply the drops to the eyes should ask their doctor. Generally, adults are told to apply one drop into the eye or eyes that need to be treated, twice per day. Never apply more than the prescribed amount of eye drops. If you notice any side effects while treating your eye condition, inform your doctor. Serious reactions may occur in some cases. Cease use of the eye drops and seek immediate medical attention if you notice inflammation affecting the eyelids, light sensitivity, crusting of the eyes, weight gain, redness of the eyes or any other side effects which have not been listed here. Patients who wear contact lenses should ask their doctor about whether or not they can be safely worn during treatment with these eye drops. If you drive, it is important to note that these eye drops may cause blurred vision. Always use Dorzox-T Eye Drops (Dorzolamide/Timolol) as you have been prescribed by your doctor. Never self-medicate or change your dosage without first consulting your doctor. The correct dosage can vary depending on your health, medical history, and the severity of the condition being treated.